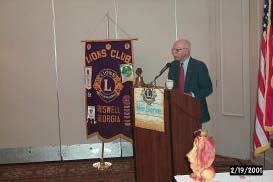 Habitat for Humanity | Roswell Lions Club, Inc. 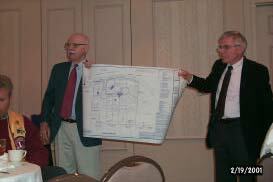 In February 2001 Gene Stelten, Director of Development from North Fulton Habitat for Humanity came to a regular meeting and shared his groups’ future plans with us regarding the building of sixteen homes on Mid-Broadwell Road in Alpharetta. The first phase of this project would begin in June. Four homes will be built by more than fifteen area churches. Members of the club voted unanimously at the meeting to commit the monies to build a house as part of an LCIF grant. One of the requirements for the LCIF grant is that the house will be built for a blind or disabled person. In April 2002 at the convention, District 18-A passed a resolution approving the Roswell Lions’ Lions Club International Foundation grant for our Habitat for Humanity project. The next step is for Lions International to approve the grant.